Another couple who called their van Vincent, surely not! Well apparently so. 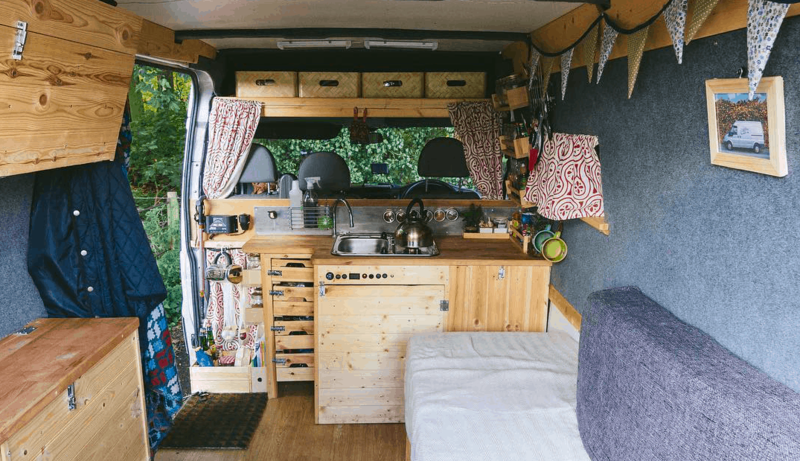 Rose and Seb from @vincentvanlife have been living in their self converted campervan Vincent full time for a couple of months now so we thought it was about time we caught up with them to find out more about what it’s like to live and work full time in a campervan and how they’re finding it. We’re Seb & Rose, and we live in our van full time. Seb is originally Sutton In Craven near Skipton, and Rose was born and raised in York. We live in a self converted Vauxhall Movano Maxi Roof. We wanted the extra so that we could comfortably stand up and create a static bed level. The extra height has also made for huge amounts of storage, plus it’s wider than a standard sprinter too. Rose – We wanted a simpler lifestyle, and we wanted a place that we could truly call our own. I guess one thing that makes us different from a lot of the van lifers on Instagram is that we aren’t actually travelling yet. 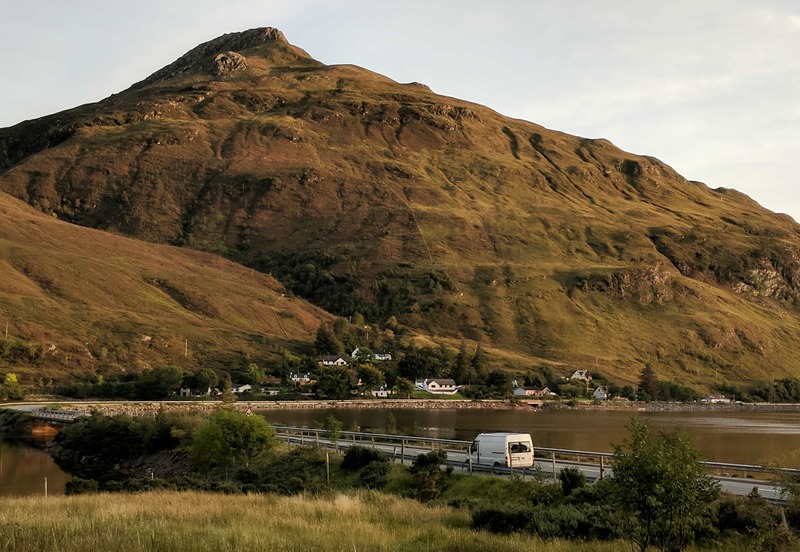 We’re living in our van first for a while whilst working to save up money, so that we don’t have to be constantly working when we eventually set off on our adventures. We’ve both always wanted to see the world, but have never fancied lugging a great backpack around with us or sleeping on trains from place to place. Being in a van allows us to take all of our home with us no matter where we go. Seb – Everything has a place, and we only have what we really need. The process of moving from a terraced house into a van was quite cleansing; we got rid of so many things that we just didn’t need, things that we’d forgotten we even had. It’s amazing how much you hoard without realising it. 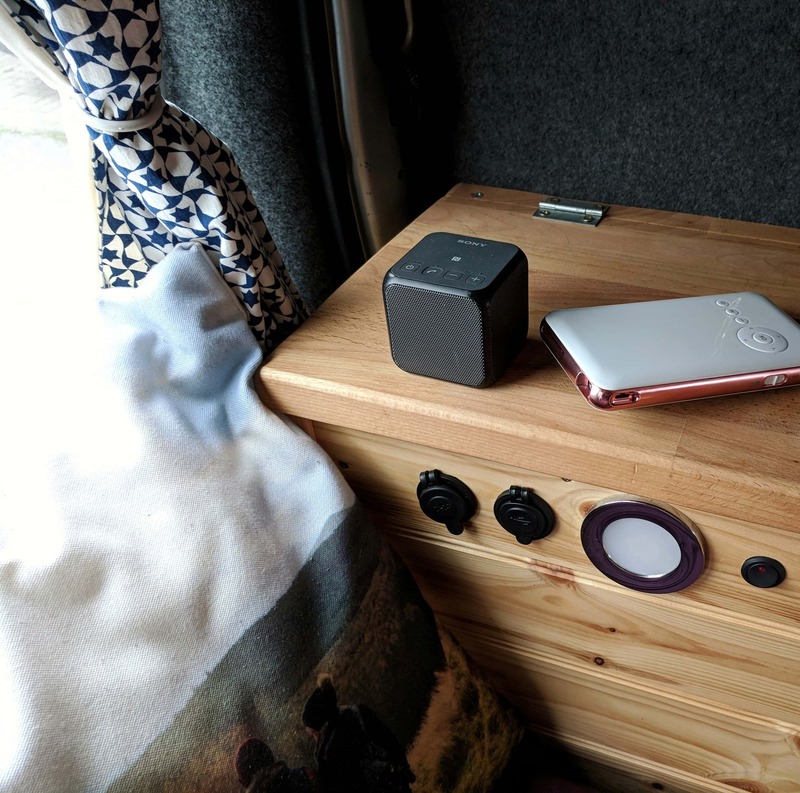 We each have our own favourite parts of the van; for Rose it’s the static bed and the ability to be able to relax without having to make up a seat or bed every time. For me, it’s the log burner. Nothing heats your van up quite like a log burner, especially in the winter. We always wanted to have a house with a coal fire in it, and now we do! Obviously there’s the financial aspect as well; we’re saving lots of money on bills and rent that we nolonger have to pay! 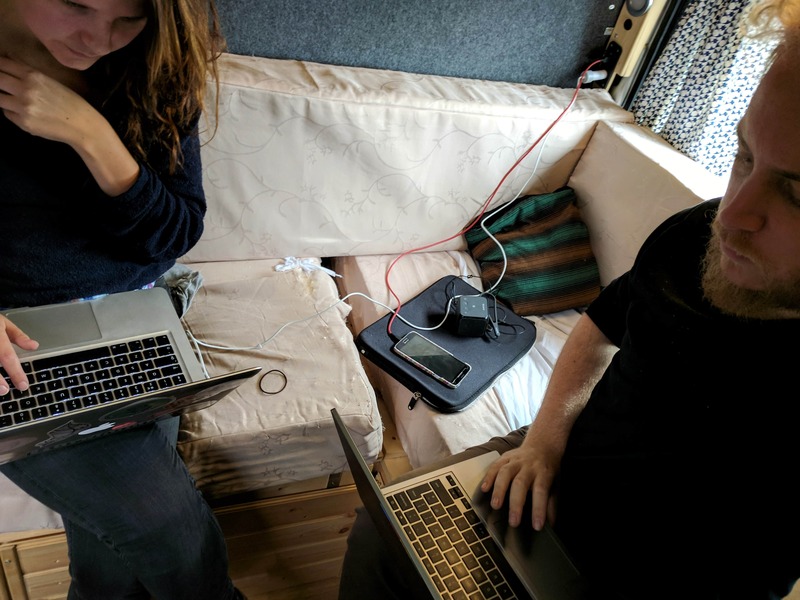 Rose- If truth be told, nothing has become harder or more complicated since moving into the van, it’s just a different challenge that needs facing. Having to fill up our water canisters once a week means that we are more conservative with water, and it’s made us think about how much we used to waste when we lived in our house. Showering at the Gym might seem like a pain, but it means that e have a dedicated time to exercise (we’ve found that we don’t walk as much now we have a mobile home!) Once you change your mindset everything becomes a lot less complicated and you quickly get into your new way of life. When we go round to people’s houses now we find ourselves gravitating towards the smallest room, there’s just too much space! Seb- Pretty much what we’re doing now, which is working on our separate businesses. The only difference is that we’d have a house and no money to help fund them. Rose is setting up her own clothing and apparel company, Velvet Thread and I’m finishing my first fantasy novel which I’m hoping to publish early 2018. Being on the road means that we have far more time to dedicate to these things; there’s no more long cleaning days or as many distractions now, and we’ve found that we’re being a lot more productive. Rose – I think its the positive reactions that we’ve received from the people that we’ve met along the way. From the build process on our street, right through to living in Vincent full time, we’ve spoken to lots of people who have wanted to do a similar thing, who would like to do but don’t know how, or have done something similar and given us handy tips and advice. You don’t need to be a master craftsman to build a van. This is probably the most important one of all, and you need to remember it. We had no woodwork or electrical skills whatsoever, in fact we’ve pretty much learnt on the go and made things up as we’ve gone along. That’s the beauty of doing a project like this – you can make your home look however you want! You can design crazy, wacky things that a conventional estate agent would laugh at, and you can get really creative with your storage. So don’t panic if you’ve never used a jigsaw before or if you don’t know your softwoods from your hardwoods, there’s plenty of help out there on the internet. Chose your van carefully. Take your time, and don’t let anyone pressure you into a deal. You want to make sure that you get a decent van with a fairly low mileage. There are lots out there, but like any good bargain they just take a while to find.Plan your build, sketch it out, visualise it as such as possible, and then just do it. The most important thing is to have fun; don’t take yourself seriously (unless George Clarke is round your gaff filming the next episode of Amazing Spaces, then you might have to get down to business more than usual). Fill your new home with positive memories that you can take with you all over the world. You can follow Rose and Seb on their instagram @vincentvanlife and Rose’s clothing company @velvetthread and if you want to see and hear more about their life in their van you can head on over to vanclan.co where they have a bunch of articles written about their conversion and their life living full time in their van.